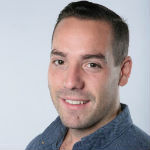 When Community Boost CEO Cameron Ripley joined us for part one of our Google for Nonprofits webinar, he walked us through how to best set up the $10,000 AdWords grant from Google. 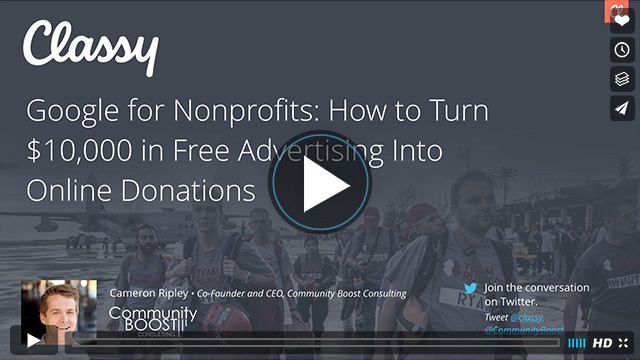 During part two of the webinar, Ripley invited his COO Matt Better to diagram the specific benefits that this $10,000 advertising spend budget can bring your nonprofit. Mainly, these benefits are related to a common problem the duo notices when consulting with nonprofits. The advertising spend budget awarded to nonprofits isn’t leveraged successfully, which Ripley and Better count as a huge missed opportunity. However, if your nonprofit effectively maxes out that budget, Google Ad Grants has the potential to be one of your top traffic drivers for your website. Check out a few of our favorite takeaways from the webinar. Success here centers on choosing the most relevant keywords, but how do you know which keywords to pick? A good first step is to take a look at your website’s language. How are people using keywords to find your organization? Ripley and Better suggest keeping the initial list of keywords somewhat small to start. That way you’ll be able to manage, track, and organize your different campaigns easier. For example, you can observe when certain ad groups outperform others. Further, since you allocate your advertising spend budget at the campaign level, this will help you determine which specific campaigns to push funds to and which to phase out. Explicit: People type in exactly what they’re looking for. Problem: People type in the problem that your nonprofit solves. Symptom: These keywords describe the symptoms of the problem. Branded: People type in the nonprofit’s name. Outside of this, you also have to consider the different ways people are going to use words, literally. For example, if you’re dealing with the term “ocean” you can’t ignore that a lot of people often refer to the “ocean” as the “sea”. Google has a tool called the Keyword Planner, which shows the different ways people use alternative language in their keywords. Beyond that, it suggests keywords, shows monthly search volumes for keywords, and shows how competitive a keyword is. At the end of the day, the aim for Google is to help users make the most well-informed decision they can. Google will always favor optimized ads over ads that aren’t. Remember, Google will reward your account by lowering the CPC and giving you better ad position if you have results. Ripley and Better notice that the first thing nonprofits want to track is online donations. Sometimes that’s all they want to track, and while it’s absolutely important it’s not the complete picture. This process is helpful when determining what’s working, what keywords are leading to conversions, and how to increase ad performance month over month. Ripley and Better also recommend that nonprofits focus on negative keyword research, which consists of removing irrelevant keywords triggering your ads. On the opposing side of this is keyword expansion, where you improve your results by seeing what relevant and previously unknown of words are triggering your ads. No question about it, there’s a lot to be gained by mastering the maximization of your Google Ad Grants advertising spend budget. Chief among the myriad benefits is that you can shoot for the next tier up: Google Ad Grants PRO. Instead of $10,000 every month, the PRO level gives you an advertising spend of $40,000–that’s $480,000 in free advertising per year. As a bonus to our webinar, Ripley discusses the application process and what prerequisites you need to have in order to attain the PRO rank. Be sure to listen to the whole thing below to map out your nonprofit’s strategy.